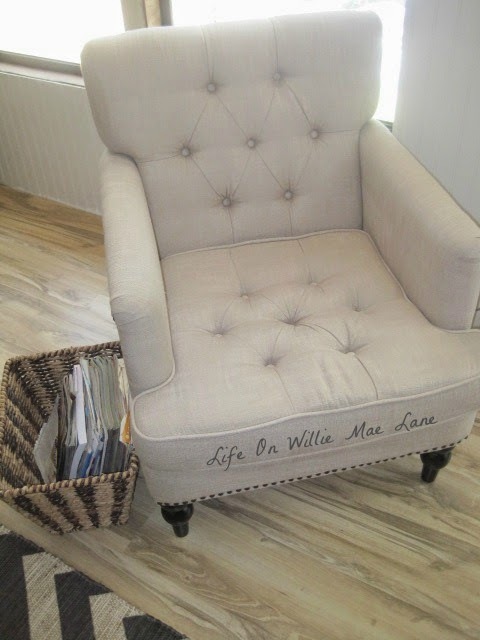 Life On Willie Mae Lane: Before & After and a Sneak Peek! Wow! It's been a little over a week since I last posted. I want to share a few before and after projects and a little sneak peek of part of my living room. 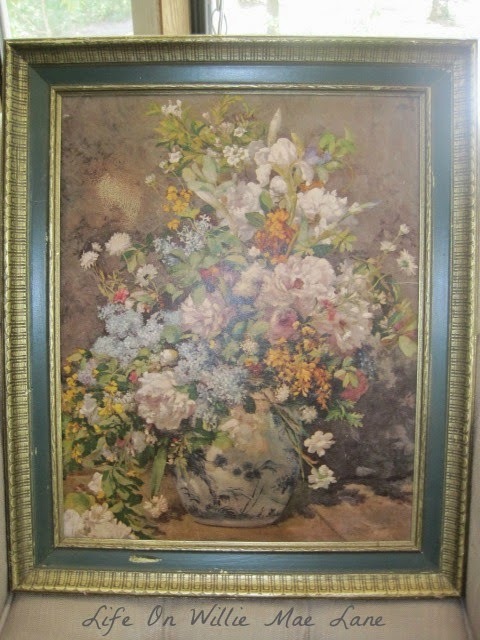 I bought this pretty print of a painting at the Goodwill last week. I have been on the lookout for something similar. This one is 16 x 20. I love the colors in the bouquet but I wasn't loving the frame colors. I tried painting the green part white but didn't like it at all since the white was too bright for the painting. I had almost decided to leave it as is when it hit me last night to paint it satin nickel. All my new fixtures and hardware are in satin nickel finish so I knew it would blend in nicely. I decided to go for it and if I didn't like it, then I would just worry about it after the fact! Here it is and I love it! Sorry for the glare. It was dark when I took this so the flash is on. And, it is sitting on my stove since that's one of the few clear surfaces in the house right now! This will be hanging in my dining room. You may remember me telling you a few weeks ago about the free 16 x 20 print I ordered from Shutterfly for just $4.95 shipping. Well, it came in and I needed a frame for it, so of course I bought a used one. 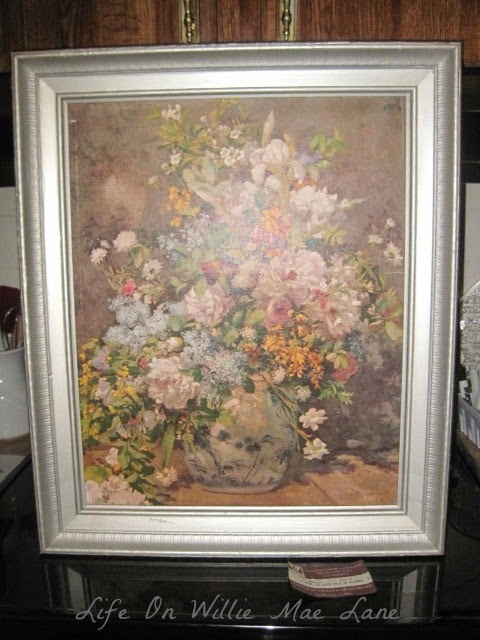 I found this one at the Hospice thrift for a couple bucks. Only problem was I didn't like the colors at all. And they did nothing for the print! So, I decided to go bold! I painted it coral and I love it...a lot! This print will hang on my wood plank wall in my living room...eventually. I'm not hanging anything until we have all the trim done. 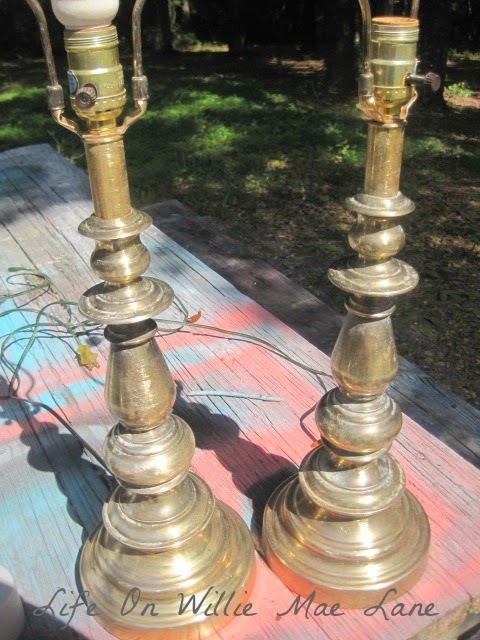 Next up is this lovely sad looking pair of brass lamps. I have had these for a couple years just waiting for my remodel. My Aunt Loretta bought these for me at the thrift store for just over $1 each. She knew I could make them pretty. They actually look really good in the photo below. I had already sanded them and cleaned them. They were so nasty looking and even had some surface rust spots. I primed them before I painted them, but I am not sharing all those pictures.,,,not now anyway. I painted them aqua blue...much better! They will sit on my buffet in the dining room. I have it painted, but still need to wax it and put the handles back on, so maybe I can share it soon. Here it is lit with the new shade. I left the plastic on the shade until I put them in place. We have so much dust in the air from the renovations. 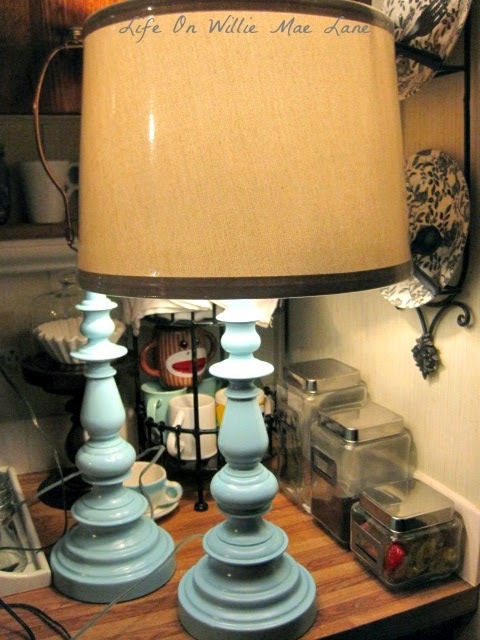 The shades are an oatmeal color and look really pretty with the aqua blue. The buffet is white and will sit against the dark wood plank wall we installed in the dining room. It's all going to be so pretty! Just a fun picture of Sadie. She thinks she's a chihuahua...:) She loves to climb up in the hubby's lap and sit or lay on her back...lol! OK...now just a little sneak peek. We still have so much to do...all the window trim, install new doors and trim them out, base boards, and crown, but we are getting there, I am showing you my new chair here. I love it! It has nailhead trim and is tufted. It has the cutest little legs too and is the perfect size for my small living room. You can see the new flooring here too. We got such a steal on this laminate at Lumber Liquidators last year and stocked up on it. It's the same flooring we used in the guest room last November. I love the color. 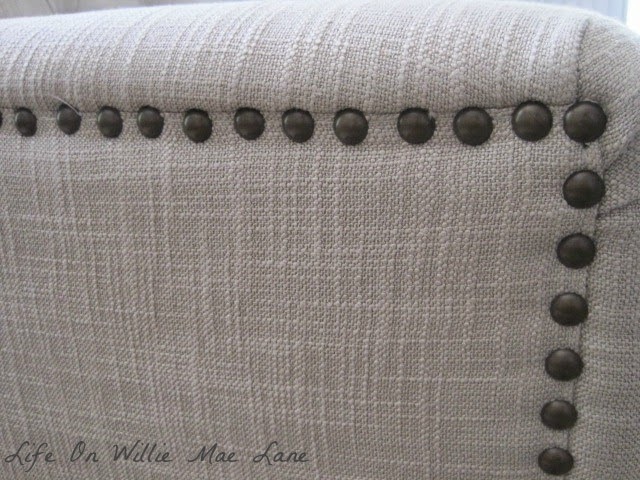 Here's the side of the chair arm....love the nailhead trim! 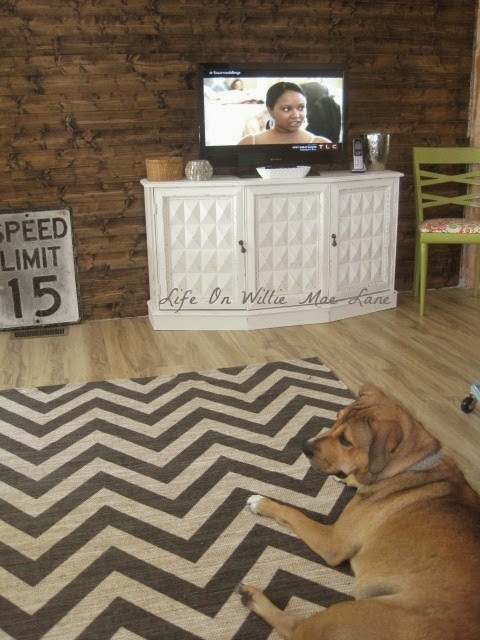 And here's a sneak peek at the plank wall with the newly painted credenza and my new chevron jute rug.It came from Overstock as well and I love it! Sadie does too...:) Some of you might have noticed the speed limit sign sitting there against the wall. The hubby bought that home from work. It is pretty old. No stickers on it, the letters and numbers are raised on the sign. He was going to hang it in his shop, but I asked him if I could hang it in the house. I love it...really love it. 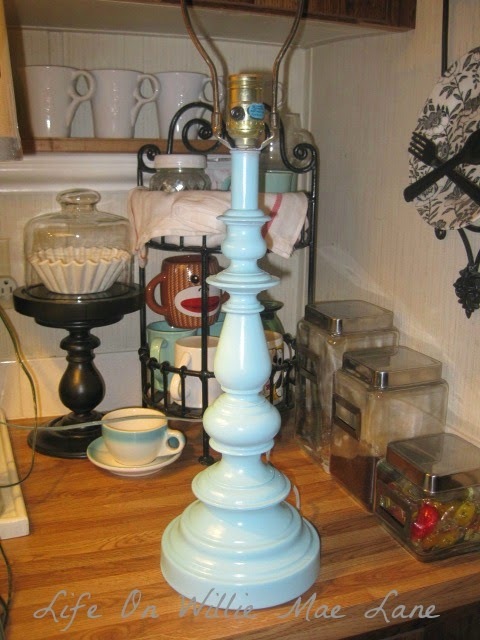 It's so cool and my living room art is going to be a little eclectic....things I have made, repurposed, and love. It's going to be awesome! So, that's it for today. I have been busily redoing stuff during the day while the hubby is working and we work on the reno in the evening. We are currently working on a huge wall of built in cabinets and bookshelves in the dining room. I am beyond excited about this project and can't wait to finish it and share. It will hold so many things....of course it will hold all my books, but the cabinets will hold my tablescaping dishes and glassware, as well as all my crystal serving pieces. One of the cabinets will hold games and another will hold home decor items and miscellaneous things. I have always lacked storage in my mobile home and this piece will be a workhorse. It is going to be pretty too...just wait and see! I have one more bit of exciting news to share with you today as well. Most of my regular readers will remember me asking for special thoughts and prayers for my friend Heather who has stage 4 colon cancer. You may remember she had 4 spots on her liver and 3 of them were gone a couple months ago when they did her scans. Well, yesterday, she had more scans and the spot is still there, but it in inactive.....which means she is in remission! I am so very excited for her and she is so relieved, excited, and thankful. They will do blood work in a month and another PET scan in 2 months, but for now, she is done with her treatments! Thank you so much for your thoughts and prayers. You all are such a blessing to me and I am truly grateful for each and every one of you. Cool! Cool! Cool! Love the sneak peaks. Can't wait to see it all. And I'm very, very happy happy and thrilled to hear about Heather. Praise God! Hooray for Heather's news! Where do I start? Well, first I would steal the speed limit sign in a skinny minute. I think it will look quite cool in your space. Love the new chair and the chevron rug - with the speed limit sign. Great work on the frames - Maybe a gallery wall with the speed limit sign? Sadie is so sweet cuddled up in Joey's lap. Make sure she obeys the speed limit sign! Your home is looking great, Vicky, and I can't wait to see everything! Wonderful news from Heather! Love everything you have done so far...those lamps are great. Morning Vicky I also love the new painted lamps! And the picture frame is perfect! I feel inspired and I truly know how much work it all is. PTL for Heather and seeing Him work! Enjoy and be blessed for the rest of your home makeover! You have been busy and I love your repainting jobs! They all look so much better with the makeovers! Have a great weekend! Vicky, that is the best news about your friend! God is so good! Love the sneak peeks at your room! 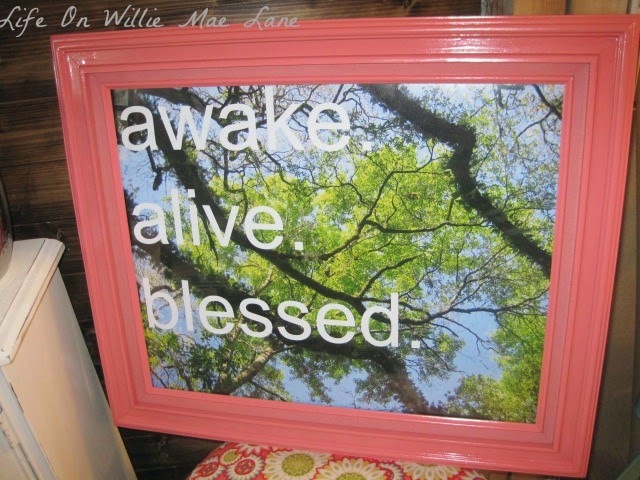 The sign, the print (love the frame painted nickle) and your photo will just be awesome on the walls. Love the new chair also. I never did order that free print...oh well, next time! I'm getting ready to take a much deserved vacation! Oh, I can tell your room is going to be beautiful. Such good news about your friend, thanks for sharing with us. 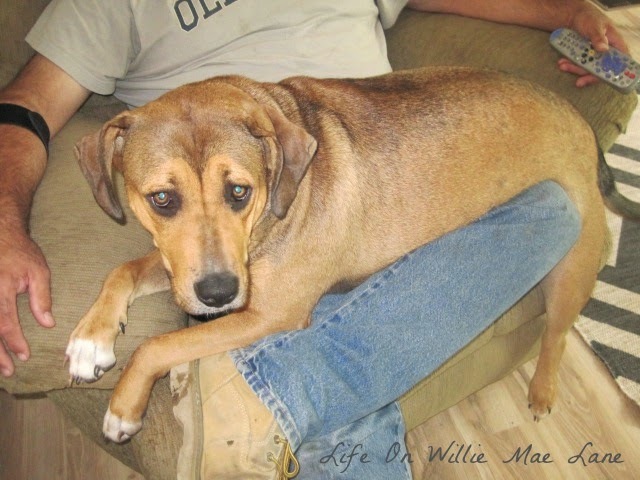 Funny how are large dogs think they are lap dogs, Doyle does the same, lol. Oh, everything looks so great!! I just love the lamps, the flooring, and the chair! Pretty much everything, lol! It's all wonderful. Can't wait to see it all put together! Great news about your friend, that is awesome to hear! That is beyond fabulous news about your friend Vicky! Life is good :). You've been pretty busy I see, and I just love how you perked up that frame. Sometimes that's all that's needed to bring something into the 21st century. Woohoo! Such great news.. God is good! Your sneak peek is gorgeous... love the color of the floor with the darker color of the plank wall. It is looking fabulous Vicky! Everything is coming along nicely! I am really looking for forward to seeing your finished reno. God is good and he has shown it again in Heather's remission. So very happy for her, her family and friends. Oh my... I can't wait to see the ending results of everything! You and your hubby are doing an amazing job! I just love that speed limit sign too... Your house is going to look just fabulous! Praise the Lord for the good news on Heather! God is so good! Have a wonderful weekend, Vicky! Great news about your friend! I love the new look of your room: the armchair is amazing and so very chic! I'm most impressed how painting the frame and background of the painting changed it completely! It'll look perfect in your dining-room now. Such good news Vicky for your friend Heather! May she continue to beat this. Your renovations are coming along so well, I just LOVE that sign! Oh Wow Vicky - everything looks gorgeous - I love that floor too ( we are going to build a plank wall in one of the rooms downstairs - so loved seeing the sneak peak of that - the frames are gorgeous - and those lamps are just perfect ! All of your hard work is certainly paying off !